Sealaska Heritage Institute’s new book Shanyaak'utlaax: Salmon Boy has won the 2018 American Indian Youth Literature Best Picture Book Award from the American Indian Library Association (AILA). The book, which was illustrated by Tlingit artist Michaela Goade, was published through Baby Raven Reads, a Sealaska Heritage program for Alaska Native families with children up to age 5 that promotes language development and school readiness. Baby Raven Reads in December won the title of 2017 Library of Congress Literacy Awards Program Best Practice Honoree. SHI’s Baby Raven book How Devil’s Club Came to Be in February was reviewed by the American Indians in Children's Literature (AICL) blog as a recommended title. The accolades given to the Baby Raven Reads program have been exciting and humbling, said SHI President Rosita Worl. 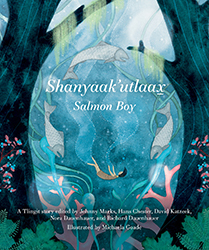 Salmon Boy: Shanyaak’utlaax, which was published in 2017, is a children's story that teaches about respect for nature, animals and culture. It comes from an ancient Tlingit story that was edited by Johnny Marks, Hans Chester, David Katzeek, and Nora and Richard Dauenhauer. The traditional Salmon Boy story is complex and has been adapted to be age appropriate for younger students. The book won the award because of the illustrations, which were made by Goade, an artist and graphic designer currently residing in Juneau. Her Tlingit name is Sheit.een and she is from the Raven moiety and Kiks.ádi Clan from Sitka, Alaska. Raised in Juneau, she spent her childhood in the forests and on the beaches of Southeast Alaska and her artistic style is rooted in the depth and beauty of its landscapes. At the heart of her work, whether it's a logo or book illustration project, is a passion for evocative storytelling. After earning her degrees in graphic design and marketing from Fort Lewis College, she worked as a designer and art director in Anchorage, before embarking on her full-time freelance career and returning to Southeast Alaska.